Big Hearts Come in Small Packages. 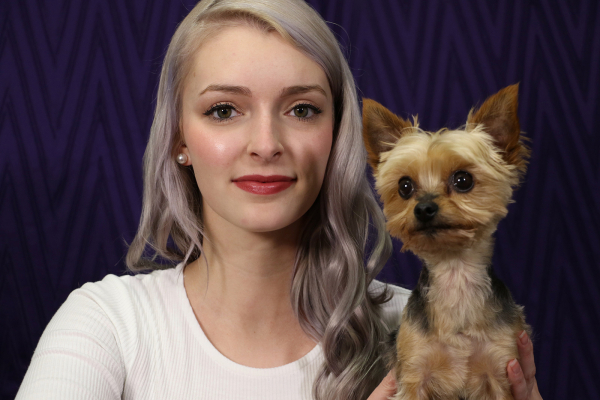 Chelsea is the adoring pet mom to 4 pound Yorkie, Tetley, and an orange tabby cat named Orange Pekoe – which is ironic since, as much as she loves her pets, she doesn’t like tea at all!. Most say Chelsea and Tetley are very similar because they are both tiny and friendly. They love enjoying the outdoors together, but in the winter prefer to binge watch Netflix, inside where it’s warm. Chelsea may have an undiagnosed poutine and pizza obsession, preferring either to a big fancy meal. She loves to travel and hopes to someday see the world but hasn’t visited that many places yet. Chelsea has been working in the veterinary field since 2012 and counting – much to the delight of the animals in her care. She loves going to work every day and counts herself lucky because not only does she get to help animals, she also gets to see her awesome co-workers who have quickly become her family.